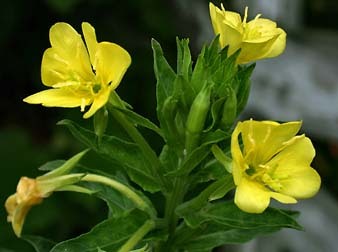 This is a cheerful North American herb that blooms with bright yellow flowers that, as its name suggests, open up at night and close around noon. It is easy to spot in the wild and can grow almost anywhere, which makes for a very low maintainence addition to the garden! Used traditionally by Native Americans as a salve to treat topical wounds and hemorrhoids as well as an infusion used as an astringent and sedative. It is well known today for the abundance of gamma linolenic acid (GLA) found in its seeds (7-14%). The body naturally produces GLA but the pathway can get blocked due to diet, lifestyle, aging and other stressors. GLA supplementation helps to bypass this block. It has been shown to reduce inflammation in rheumatoid arthritis, relieve PMS and menopausal symptoms and improve skin conditions. Its leaves can be cooked like spinach and roots eaten like potatoes. Attracts hummingbirds by day and hawk moths by night. Prefers sun. Ht 6 inches – 3 ft.